The Office 365 Security & Compliance Center lets you grant permissions to people who perform compliance tasks like device management, data loss prevention, eDiscovery, retention, and so on. These people can perform only the tasks that you explicitly grant them access to. To access the Security & Compliance Center, users need to be an Office 365 global administrator or a member of one or more Security & Compliance Center role groups. Permissions in the Security & Compliance Center are based on the Role Based Access Control (RBAC) permissions model. This is the same permissions model that's used by Exchange, so if you're familiar with Exchange, granting permissions in the Security & Compliance Center will be very similar. It's important to remember, however, that Exchange role groups and Security & Compliance Center role groups don't share membership or permissions. While both have an Organization Management role group, they aren't the same. The permissions they grant, and the members of the role groups, are different. There's a list of Security & Compliance Center role groups below. A role grants permissions to do a set of tasks; for example, the Case Management role lets people work with eDiscovery cases. A role group is a set of roles that lets people perform their job across the Security & Compliance Center; for example, the Compliance Administrator role group includes the roles for Case Management, Content Search, and Organization Configuration (plus others) because someone who's a compliance admin will need the permissions for those tasks to do their job. The Security & Compliance Center includes default role groups for the most common tasks and functions that you'll need to assign people to. We recommend simply adding individual users as members to the default role groups. You can edit or delete the existing role groups, but we don't recommend this. Instead of editing a default role group, you can copy it, modify it, and then save it with a different name. The following table lists the default role groups that are available in the Security & Compliance Center. To grant permissions to a user to perform a compliance task, add them to the appropriate Security & Compliance Center role group. Managing permissions in the Security & Compliance Center only gives users access to the compliance features that are available within the Security & Compliance Center itself. If you want to grant permissions to other compliance features that aren't in the Security & Compliance Center, such as Exchange mail flow rules (also known as transport rules), you need to use the Exchange admin center. To see how to grant access to the Security & Compliance Center, check out Give users access to Office 365 Compliance admin center. Members can manage settings for device management, data loss prevention, reports, and preservation. Members can manage settings for device management, data protection, data loss prevention, reports, and preservation. Members can perform searches and place holds on mailboxes, SharePoint Online sites, and OneDrive for Business locations. Members can also create and manage eDiscovery cases, add and remove members to a case, create and edit Content Searches associated with a case, and access case data in Office 365 Advanced eDiscovery. • View all eDiscovery cases in the organization. • Manage any eDiscovery case after they add themself as a member of the case. The primary difference between an eDiscovery Manager and an eDiscovery Administrator is that an eDiscovery Admininstrator can access all cases that are listed on the eDiscovery cases page in the Security & Compliance Center. An eDiscovery manager can only access the cases they created or cases they are a member of. For more information about making a user an eDiscovery Administrator, see Assign eDiscovery permissions in the Office 365 Security & Compliance Center. Members can monitor and view mailflow insights and reports in the Security & Compliance Center. Global admins can add ordinary users to this group, but, if the user isn’t a member of the Exchange Admin group, the user will not have access to Exchange admin-related tasks. Members can control permissions for accessing features in the Security & Compliance Center, and also manage settings for device management, data loss prevention, reports, and preservation. Note that in order for a user who is not a global administrator to see the list of devices managed by MDM for Office 365 and perform actions on these devices, such as retiring a device from MDM for Office 365, the user must be an Exchange administrator. Office 365 global admins are automatically added as members of this role group. Members can manage and dispose record content. Members can only view the list of cases on the eDiscovery cases page in the Security & Compliance Center. They can't create, open, or manage an eDiscovery case. The primary purpose of this role group is to allow members to view and access case data in Advanced eDiscovery. This role group has the most restrictive eDiscovery-related permissions. Members of this role group may include cross-service administrators, as well as external partner groups and Microsoft Support. By default, this group may not be assigned any roles. However, it will be a member of the Security Administrators role in Azure Active Directory and will inherit the capabilities of that role. To manage permissions centrally, make changes to this role in the Azure Active Directory admin center - for more information, see Administrator role permissions in Azure Active Directory. If you edit this role group in the Security & Compliance Center, those changes apply only to the Security & Compliance Center and not any other services, whereas changes made in the Azure Active Directory admin center affect all services. 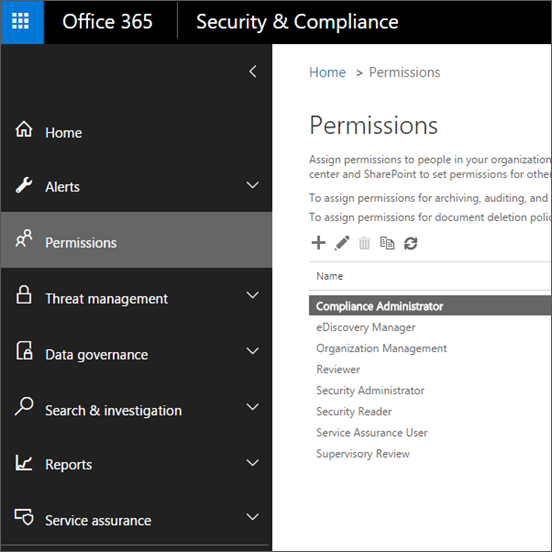 All of the read-only permissions of the Security reader role, plus a number of additional administrative permissions for the same services: Azure Information Protection, Identity Protection Center, Privileged Identity Management, Monitor Office 365 Service Health, and Office 365 Security & Compliance Center. Members can manage security alerts, and also view reports and settings of security features. Members have read-only access to a number of security features of Identity Protection Center, Privileged Identity Management, Monitor Office 365 Service Health, and Office 365 Security & Compliance Center. Membership in this role group is synchronized across services and managed centrally. Members of this role group may include cross-service administrators, as well as external partner groups and Microsoft Support. By default, this group may not be assigned any roles. However, it will be a member of the Security Readers role in Azure Active Directory and will inherit the capabilities of that role. To manage permissions centrally, make changes to this role in the Azure Active Directory admin center - for more information, see Administrator role permissions in Azure Active Directory. If you edit this role group in the Security & Compliance Center, those changes apply only to the Security & Compliance Center and not any other services, whereas changes made in the Azure Active Directory admin center affect all services. Members can access the Service assurance section in the Office 365 Security & Compliance Center. Service assurance provides reports and documents that describe Microsoft's security practices for customer data that's stored in Office 365. It also provides independent third-party audit reports on Office 365. For more information, see Service assurance in the Office 365 Security & Compliance Center. Members can create and manage the policies that define which communications are subject to review in an organization. For more information, see Configure supervisory review policies for your organization. 1 This role group doesn't assign members the permissions necessary to search the Office 365 audit log or to use any reports that might include Exchange data, such as the DLP or ATP reports. To search the audit log or to view all reports, a user has to be assigned permissions in Exchange Online. This is because the underlying cmdlet used to search the audit log is an Exchange Online cmdlet. Office 365 global admins can search the audit log and view all reports because they're automatically added as members of the Organization Management role group in Exchange Online. For more information, see Search the audit log in the Office 365 Security & Compliance Center. By default, role groups have a set of roles assigned to them. 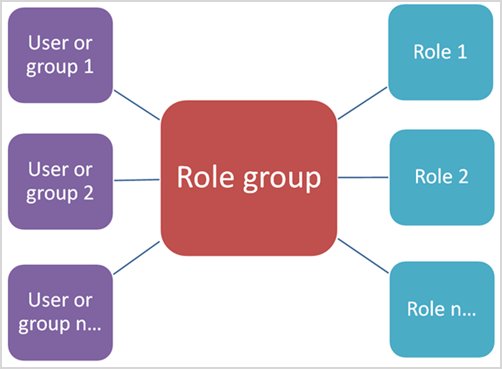 This table shows the roles assigned to each role group.